Hi there! It’s Marsha here! 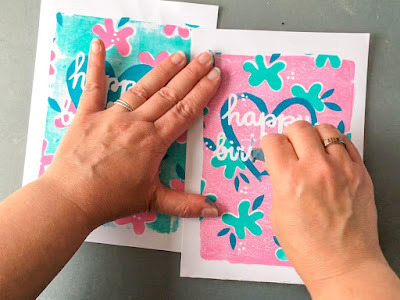 Today I’m going to show you how you can create personalized multi-layered Gelli Arts® gel prints with the help of (hand cut) DIY stencils. Take a sheet of paper that is the same size as the paper you intend to use for your gel prints. I’m using an A5 size drawing paper (5,8” x 8,3”). Bear in mind that you need to be able to cut the design. If you have access to an electronic die-cutting machine, then you can use that to your advantage and make the design as intricate as you like. If not, keep the design simple so you can easily cut it by hand. 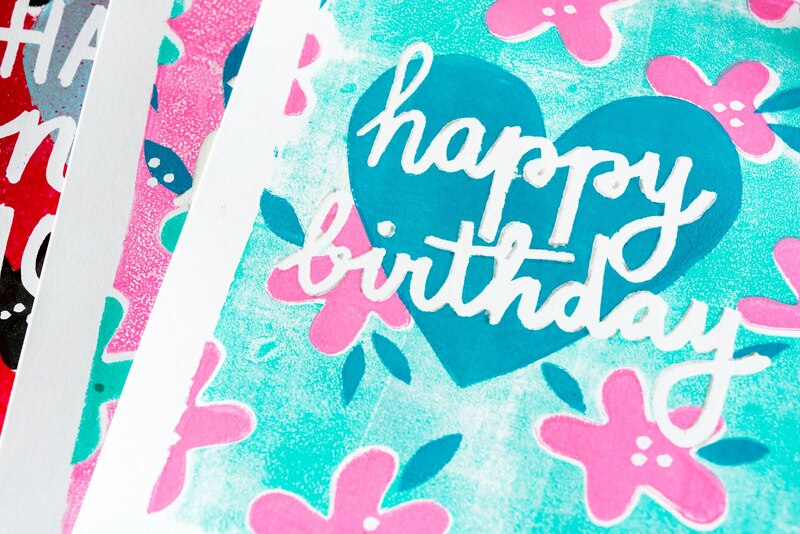 I chose a basic flower pattern with a heart in the center that will act as the backdrop for my card sentiments. 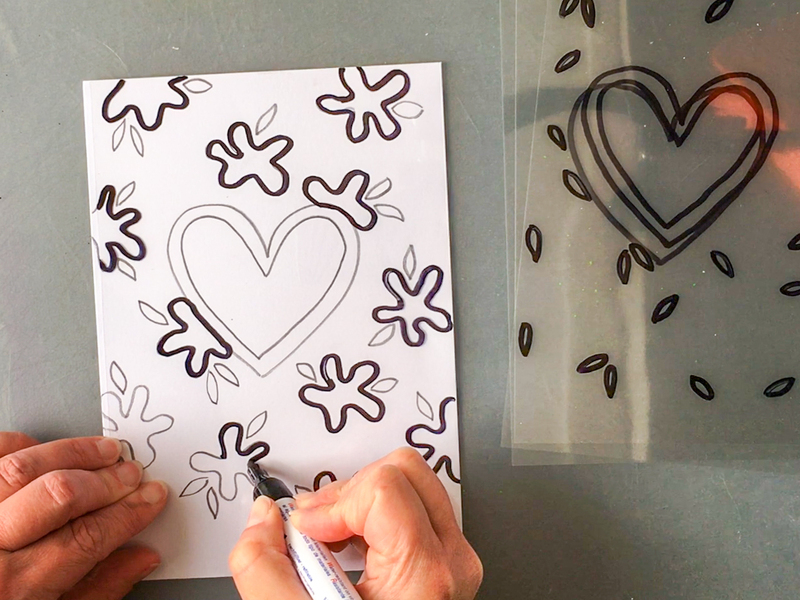 Transfer the elements of your design onto transparencies with a permanent marker. 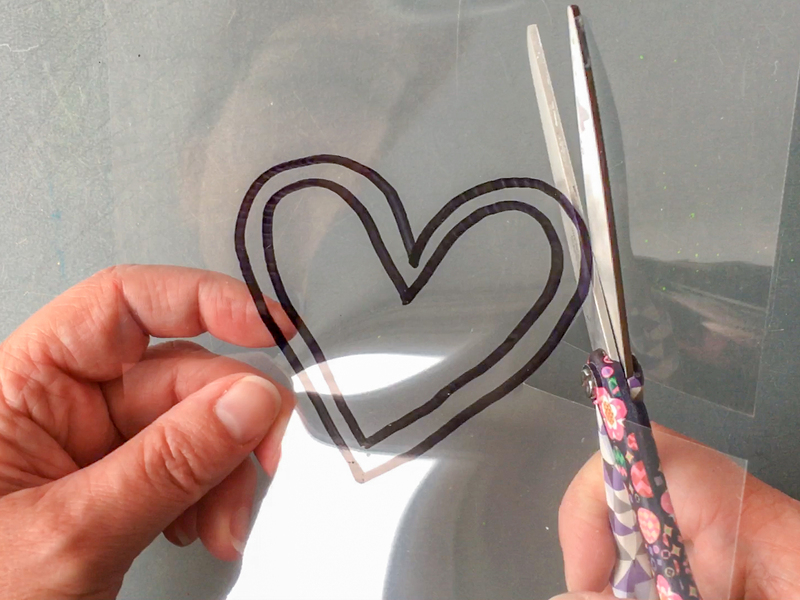 Cut the transparencies to the same size as the paper you are going to print on. 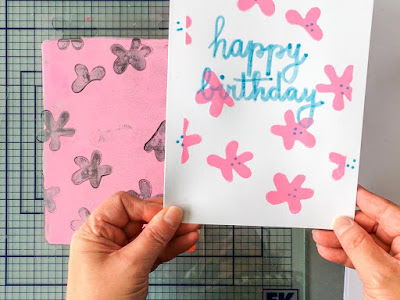 This will make aligning the paper and all of the stencils a lot easier when printing. 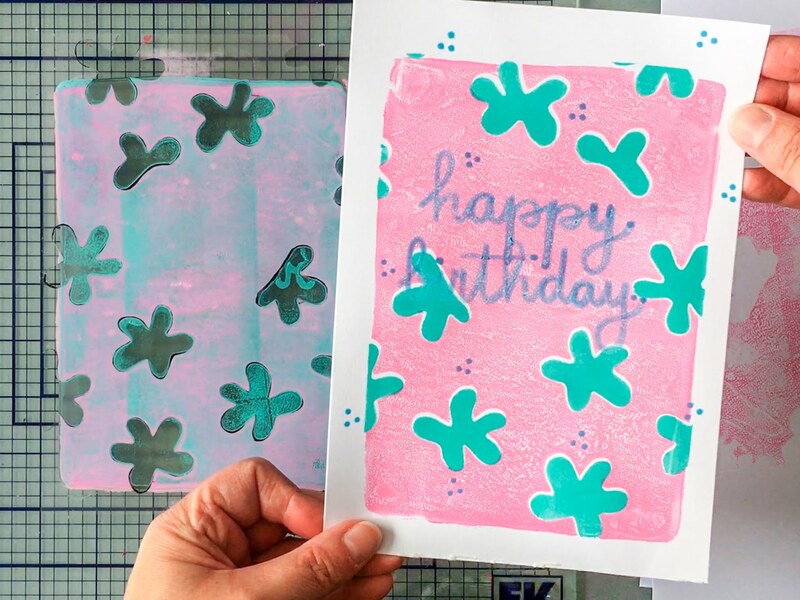 Decide which parts of the design you would like to appear in the same color on your finished prints and create a transparency for each element (or color). 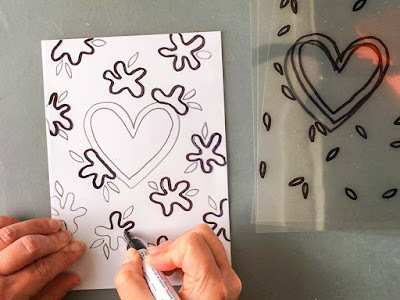 I created one transparency with all the flowers, one with all the leaves and one with the outline of the heart shape. I also created a couple of heart masks just to have some choices. You have three options if you’d like to cut them by hand. The first one is to use a craft knife. Place your transparency on a cutting mat and cut the shapes out along the lines. The easiest way to do this is to keep the blade still and slide the transparency along with your hand. The second option is great when it concerns a larger shape, and you want to create both a stencil and a mask at the same time. 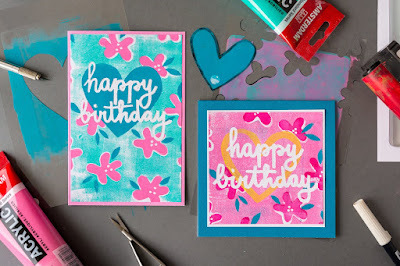 Just cut out the shape with a pair of scissors and use tape to close the cut in the stencil. And the last option is to make a small slit in the middle of a closed shape with a craft knife and then use a pair of fine pointed scissors to cut out the center of the shape. Tip: Add a mark or a small sticker to each stencil to indicate which way is the correct way up to match all of the layers later on! Prepare the paper you are going to print on by writing greeting card sentiments on them with masking fluid. 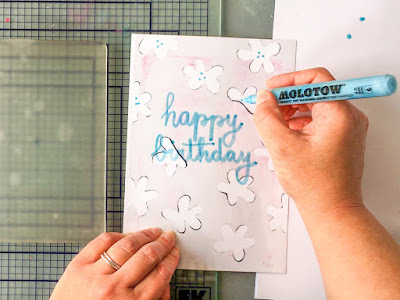 The parts of the paper covered with masking fluid will stay white, so you can use this method to add highlights or fun details too. Make sure the masking fluid is dry before proceeding. Roll a drop of paint out on the Gelli Arts® gel printing plate. I’m using the 5”x7" gel printing plate. 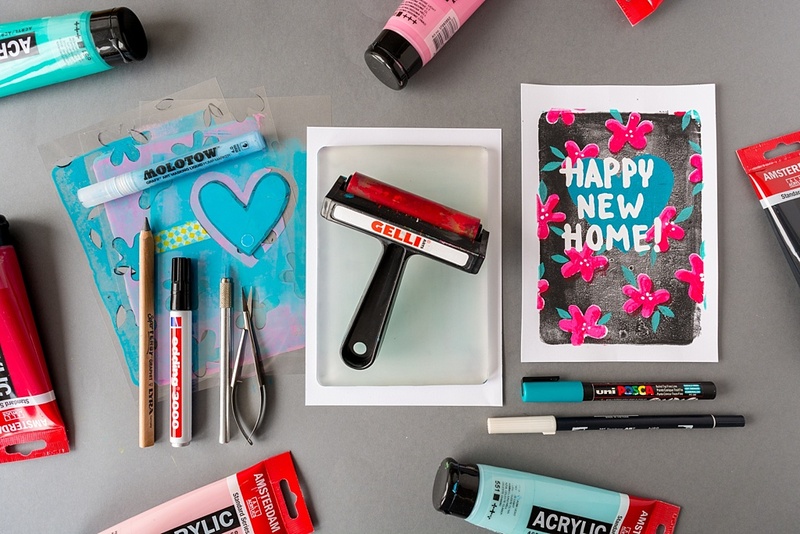 Place your first stencil on the plate and pull a print. Make sure you know the exact placement of the stencil and the paper so you can align each stencil for each following print in the same way. 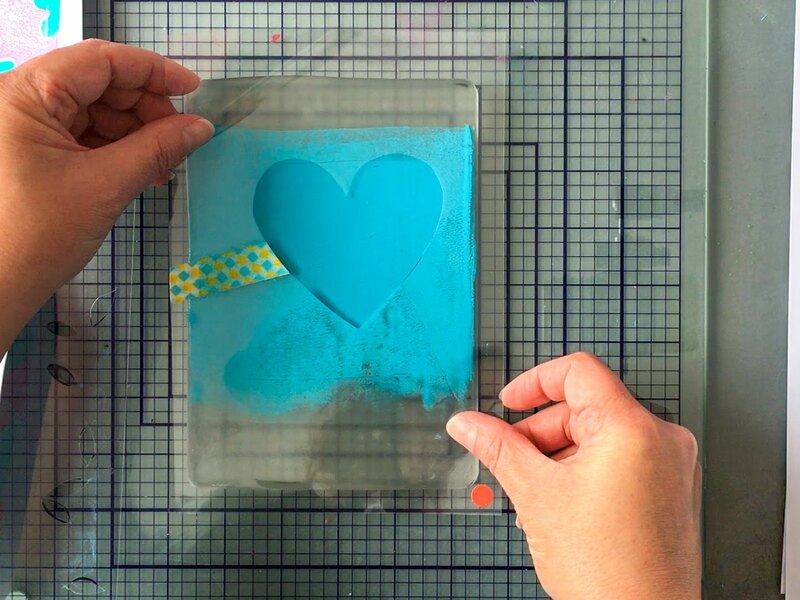 In the video, I use the grid on my craft mat, but the new 9" x 12" Gelli Arts® gel printing plate comes with a mylar sheet with 1" grid lines that helps to line up your stencils and paper. 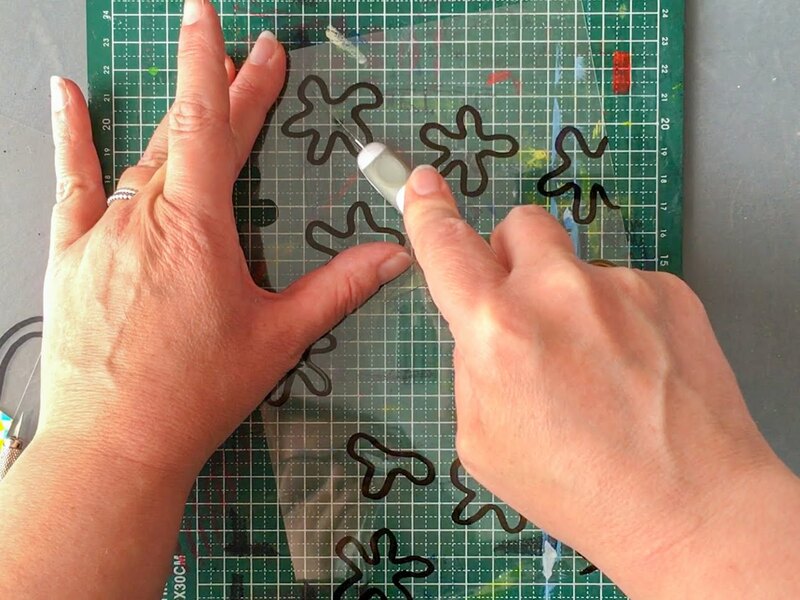 You can also place one sheet of paper under your gel plate, or you can use tape to mark the correct placement on your work surface. 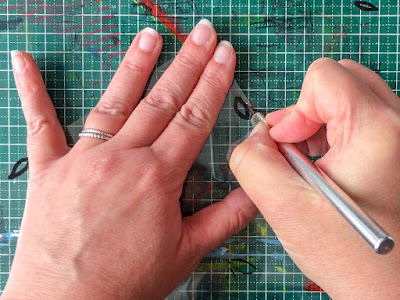 If you do not like to waste any paint, you can pull a print of the reverse image onto another sheet of paper. To do this cover the plate with thin paper and remove any excess paint from the openings in the stencil. Then lift the stencil and pull the print. This will give the print a background color. Clean the plate and then repeat this step with another color. Proceed to the next layered stencil. 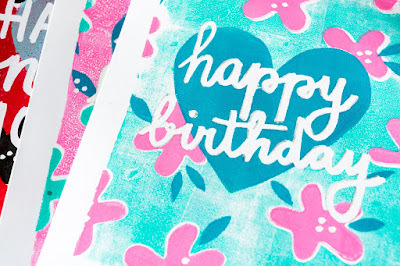 Roll paint out on your gel printing plate. Place the next stencil on the plate and pull a print. Repeat for each next layered stencil. 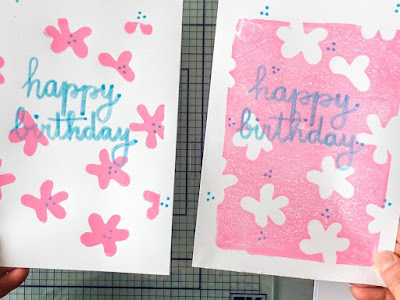 Remove the masking fluid from the prints. 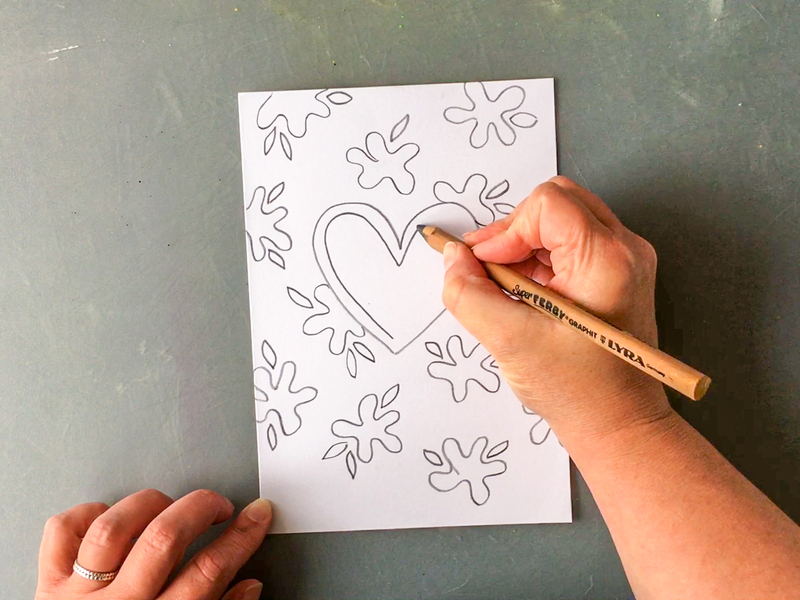 Add details, highlights and shadows with your favorite pens and markers to enhance the prints. You can frame the prints as is or you can adhere them to double note cards. 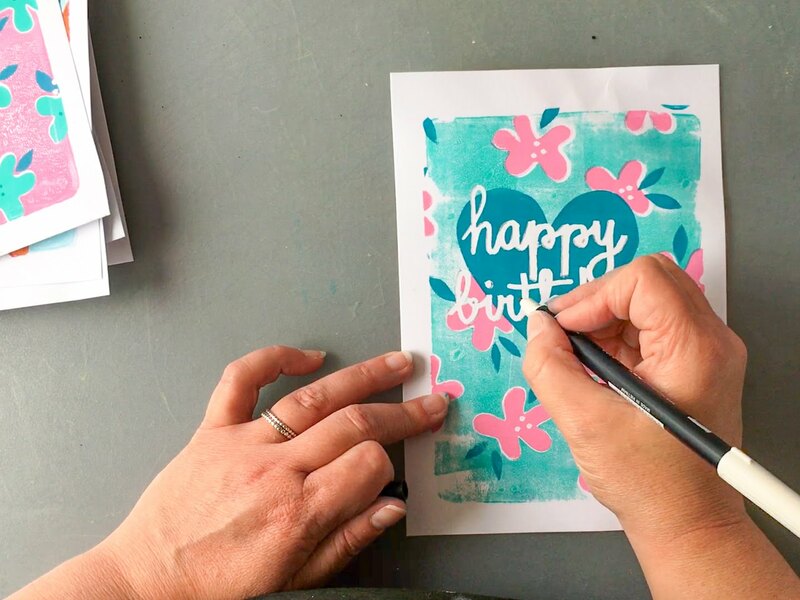 You can create a bunch at a time, and you can easily adapt the theme, color schemes, sayings and sentiments to fit your needs. So how about making a beautiful personalized Mother’s Day card?! We would love to see what you create with this technique! Beautiful. But the tip of gel medium has been out there for some time. Just saying.